Fighting Marines - I say 1952 but Topps attributes this issue to 1953 although there is a box with a 1952 copyright and the set was featured in a Topps ad in the 1953 American Card Catalog, published in February 1953. I am going to keep this as a 1952 issue in my records but it certainly seems like it was sold well into 1953. Davy Crockett - I have this as 1955-56 on the basis the first series of orange backs came out in '55 and the second series of green backs in 1956. 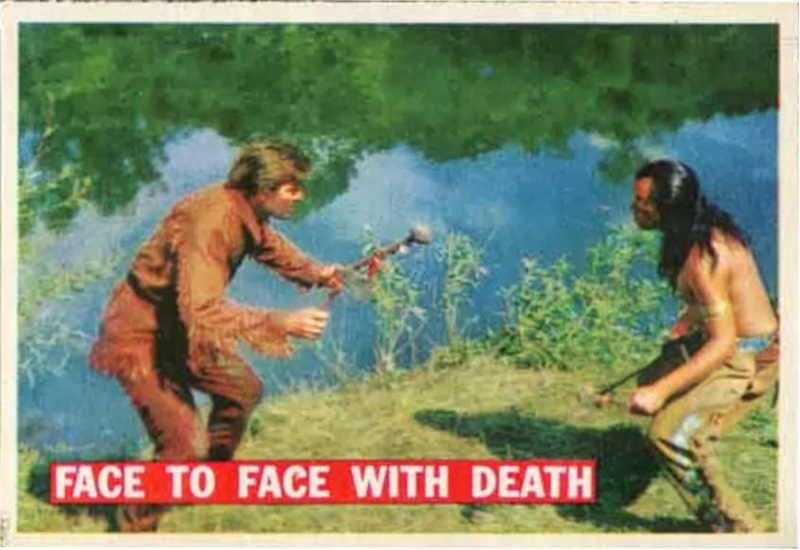 There were two motion pictures that spawned the craze and the first, Davy Crockett: King of the Wild Frontier, was released in the spring of 1955, so it seems like a stretch both series were issued a year later. Retail box indicia is silent and the wrappers for the orange backs advertise the first Crockett movie so I am going to stick with my dating. 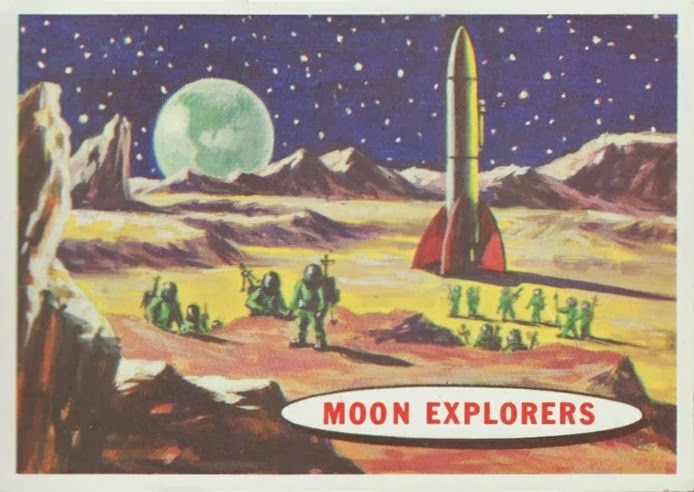 Space Cards/Target Moon - Topps has both of these as 1957. The 1957 Space Cards date seems right but Topps states Target Moon, which was a retitled reissue, came out at the end of that year. I once thought it could have been an early 60's release but since came around to it being from 1958. Based upon the Bazooka ad on the Target Moon wrapper, I am sticking with 1958 for the reissue, toward the end of the year. Civil War News - 1961 per Topps, 1962 according to every other source I have ever seen. 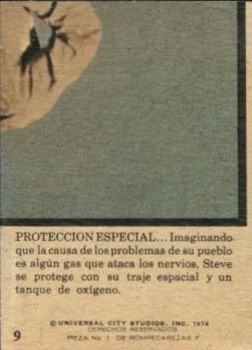 Material at the end of a Len Brown interview about CWN indicates Mars Attacks (a 1962 issue) was influenced by the earlier set. So right now, I am unsure but 1961 seems possible. 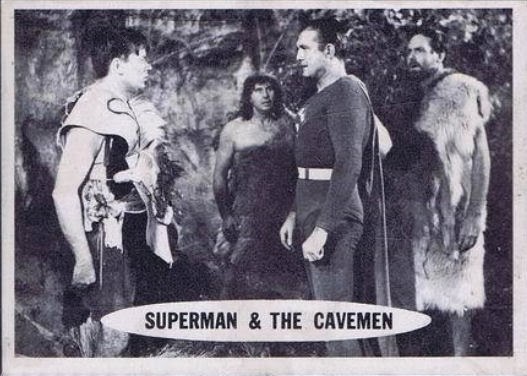 Superman - I'm going to devote an entire post to this set next time out as the Topps 75th card has some new information but this is described as a 1966 issue. I have it as 1965 but am not sold on the earlier date and have previously mused it could have been from early 1966. Going to say 1966 now. King Kong - 1966 according to Topps. I have seen 1965 or '66 in many references and it's probably a fine line as to which year it came out. However the story is that Topps could not issue the set because Donruss had a set out already and that was a 1965 issue so it makes some sense that Kong came out in '65, but only if that story is true or the Donruss date is correct! The Donruss date of issue is likely derived from the RKO copyright on the cards, just like the RKO copyright on the Topps set. The back of the Topps 75th card says that King Kong did not get a full release as it tested poorly. Right now it's a push. Soupy Sales - Topps is saying 1967 for the b&w version. I have seen that date in a number of places and it may apply to the color cards only as there was an issue of Topps Fan Magazine dedicated to ol' Soup that came out in 1965. In addition there was a second issue of said magazine featuring The Man From U.N.C.L.E. and the card set from that show is a 1965 release. The tie-in makes me think the black and white Soupy Sales set came out in 1965. 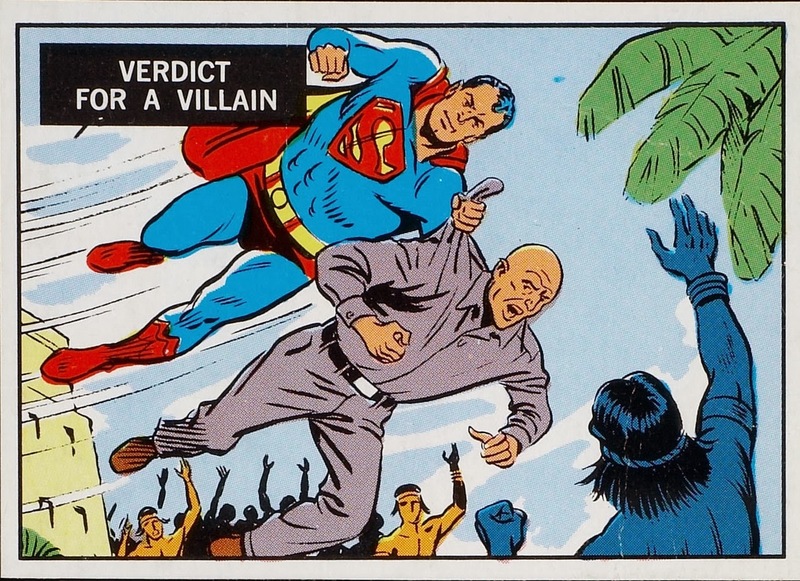 Superman In The Jungle - This rare test set is a 1966 issue based upon Topps writeup on the card back. I've always thought it came from 1968 based on a British version that came out that year and suspect the Topps 75th dating comes from the regular Superman set and could be a typo. As an aside, where's the love for the tatoo issues in Topps 75th? They would have made a great insert! Right when I thought it was safe to declare the 1971 Topps Winners checklist complete at a truncated 15, four more subjects have popped up. 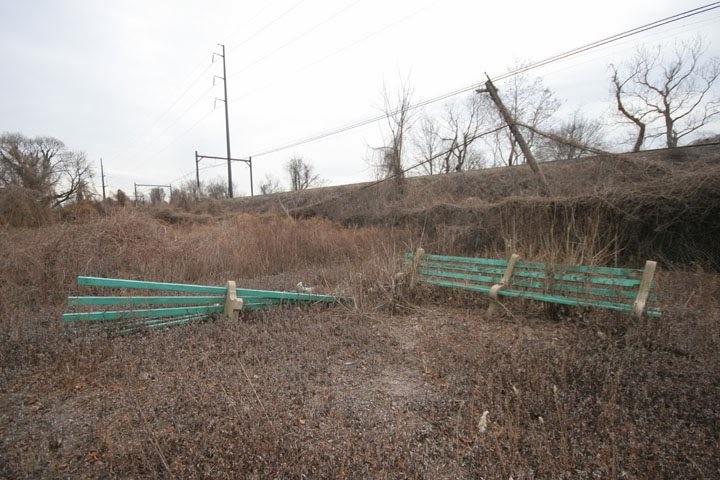 I received cell phone photos of four additional winners last year that for a trusted source, although that source wishes to remain anonymous (and is not one of my "usual suspects"). There's a reason for the secrecy, which may be revealed this year but mum's the word right now. We have 19 identified subjects out of a possible 25 and I am now thinking the other 6 could be lurking out there (or not, Topps and its mysterious ways and all....). Topps continues to surprise, even more than 40 years later! Well it's about a bazillion below zero outside as I type this post here at the Main Topps Archive Research Complex and my thoughts have turned to a warmer place, namely Mexico. 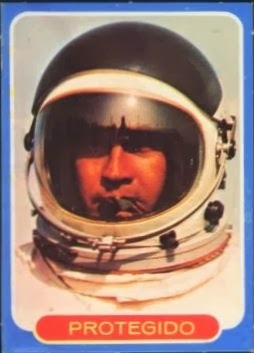 Past posts here on Topps activities in Mexico have focused on the four known sets issued in 1977: US Football, Charlie's Angels, Star Wars and Six Million Dollar Man. While the last of those carries a 1974 copyright, (and was a 1974 US issue) I believe it to be of 1977 vintage in the Mexican market as well, or at least within a few months either way. I've located some scans and information that build on previous posts (here and here) and it's definitely a good day to revisit Mexico. 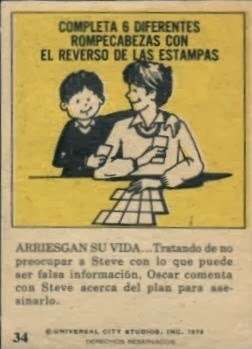 As we shall see momentarily, while the non-sports sets were licensed to a Mexican manufacturer, the Football cards were a Topps de Mexico product. Naucalpan is just northwest of Mexico City by the way. The cards look like they were "produced" there while the gum was made in Mexico City proper, at least that's what I am getting off of Google Translate. The manufacturing information along the left side of this wrapper (there are three variants, Darth Vader and C3PO also were used) shows Laboratorios y Agencias Unidas S.A., and their logo (which looks like a pop top from an aluminum can to my eyes) is an easy identifier. S.A. stands for Societe Anonyme in case you were wondering, it's roughly the same as "Inc." or "PLC" and comes from the French originally. In Mexico it's Sociedad Anónima. Rather than borrowing his images, just go to Paul's vintage Star Wars page to look at much, much more on Mexican Star Wars, including images of the rare header card and packaging. There were three cards in these packs (Star Wars had only two) and this is clearly a new series. There were four series issued in the US, with a total of 253 cards (plus 44 stickers). based upon numberings I have seen, at least three of the four series were marketed in Mexico and I suspect all four made it into the country. Star Wars and Charlie's Angels don't seem to have been issued in the loosely perforated manner that Football and Six Million Dollar Man were so I think it possible Topps de Mexico used a different printer. "Rompecabezas" means "puzzle" in Spanish. 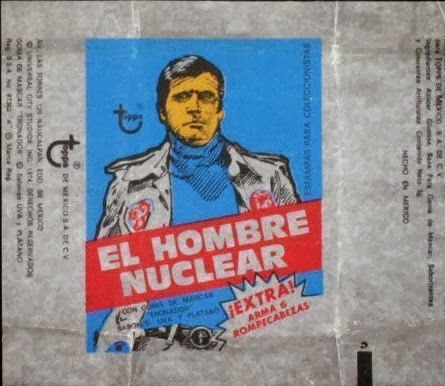 I'm not sure if Six Million Dollar Man was also issued in South America; apparently it was quite popular in some countries. I am sure though that I want to explore more of Topps international issues this year. They expanded into Canada in 1947 almost as soon as the war was over and by the end of the 1950's had a vast, it burgeoning international network established, so there's plenty to investigate. Stay warm muchachos and muchachas! I do like to delve into the 1950's bubble gum battles between Bowman and Topps and am hoping someday to take a really in depth look at Bowman Gum (someday meaning post-retirement!) but there was another rival Topps had to deal with at the end of the decade-the Frank H. Fleer Corporation. Fleer was actually a much bigger threat to Topps than Bowman ever was and they used many of the same tactics Topps did to wedge the company into the bubble gum card market. He is noted in some references as Colonel Fleer but I'm not sure if that was earned or simply an honorific. I have found some citations that state he founded a Philadelphia flavoring business in 1849 but that is clearly impossible and a little poking around reveals his future father-in-law, Otto Holstein, was responsible for that business. Such date slippage is common, sadly and all too often accepted as fact in published book and magazine articles. If I get motivated enough I may try to find his Holstein's details but I'm just giving broad background here. The Frank H. Fleer Company appears to have been founded in 1885 and I assume this was around the time Fleer married Otto Holstein's daughter Pauline . Around 1897, the story that's out there indicates Fleer tried to mix a cola flavoring with chicle and by the end of the decade was one of the first companies to retail gum in vending machines. That however, was nothing compared to events of the next decade and Fleer's development of a candy coated gum called Chiclets. Multiple sources have Frank's brother Henry inventing Chiclets in the late 1890's and this does appear to be accurate. There is some dispute over whether Henry or Frank named the actual product but no matter, the little gum nuggets were a smash hit. Not standing still, in 1906 a bubble gum called Blibber-Blubber was developed by Fleer but apparently never marketed due to a number of deficincies. 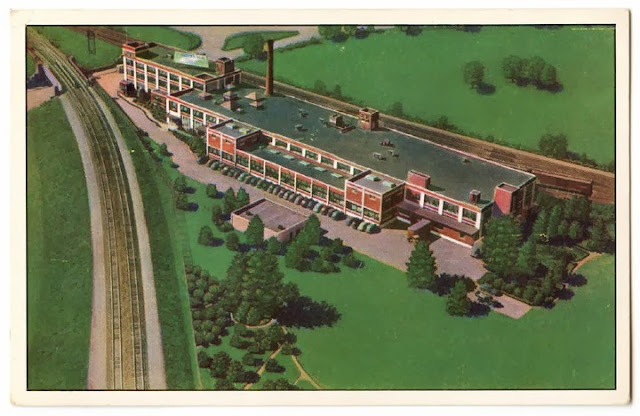 Then in 1909 Fleer sold out to the Sen-Sen Company, which was buying up confectioners and would in turn be snapped up by American Chicle in 1913 or '14 but was allowed to retain his name and right to manufacture any products not produced by American Chicle.So Fleer then started anew with the Frank. 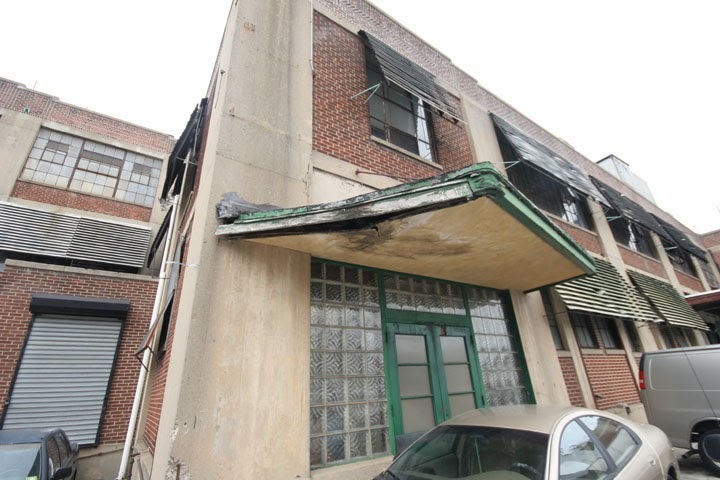 H. Fleer Corporation, of Philadelphia and primarily manufactured candy, before he retired and handed to company over to his son-in-law Gilbert Mustin. You may be interested in this little piece about Chiclets: http://www.professorwalter.com/2010/05/the-strange-story-of-chiclets-in-the-united-states.html and the man who was responsible for the introduction of chicle to the United States. 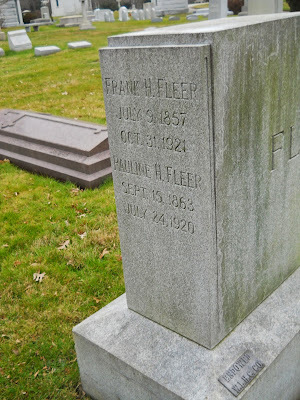 Fleer died of a stroke on Hallowe'en 1921, at his country estate in Thomasville, North Carolina. His company lived on though and in 1923 issued their first baseball cards, although they were from a pooled series of strip cards (ACC# W515-1) and Fleer just slapped an ad onto the reverse of these. There is some good information on the cards here. In 1928 a Fleer employee, Walter Diemer, an accountant with no background in chemistry hit upon the right formula after years of trial and error and came up with what we now recognize as bubble gum. Allegedly colored pink as it was the only food dye handy at the time, the product tested well and full scale production began in earnest. 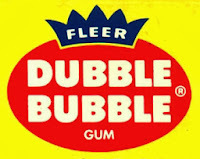 Named Dubble Bubble, Diemer, who had to show the company salesmen how to blow bubbles, declined to take out a patent on his invention in fear of having to describe his process and ingredients to Fleer's competitors and a host of bubble gum companies sprang forth. Fleer even produced a series of trading cards called Cops and Robbers (ACC# R36) in the mid 1930's. You can see some background on this set here. The disruption of World War 2 followed the 1937-38 "Recession within the Depression" and by the time Fleer and its rivals (Topps Chewing Gum now among them) were able to get access to their pre-war ingredients Gilbert Mustin had died (in 1948) and ownership of the company transferred to one Norman P. Hutson. Following his tenure, the reins passed to Frank Fleer's grandson, Gilbert Mustin Jr in 1959. Fleer did not produce any trading cards at the time but the junior Mustin would rectify that by the end of the year. Seeing the prodigious sales being racked up Topps as the baby boomers were cresting into a wave of bubble gum blowing adolescents, Fleer then did three things in 1959. First they signed Ted Williams to an exclusive contract, stealing him away from the Topps stable and then marketing a 80 card set (mostly with bubble gum) featuring his life story. Second, although Topps had been steadily refining their contractual language and extending the periods of exclusivity following their defeat of Bowman in 1956 Fleer, with the Williams set to tide them over, took a tactic from the Topps playbook and started aggressively going after the contractual rights of various baseball players, signing them to non-exclusive contracts. We'll return to this in a minute. 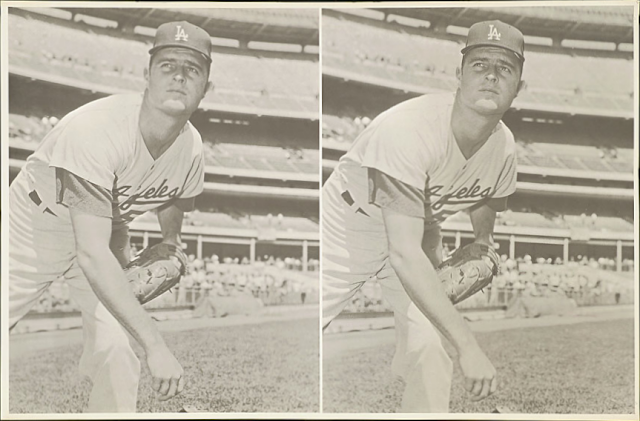 The third thing that Fleer did in 1959 was to produce two series of non-sports cards. One of these, Indian trading cards, was nothing really special but the other, The 3 Stooges, required a licensing deal and that would certainly have caught the attention of Topps. It also sold like crazy. By the time of the Federal Trade Commission hearings (initiated by a complaint made by Fleer) that delved into Topp's competitive practices of the early 1960's, Fleer had over four thousand major and minor league baseball players under contract, compared to 4,500 or so for Topps, which also had the most exclusive deals by far. In the never-ending battle to win over ballplayers, Topps even entered into legal arrangements with the trainers of the major league teams to try and gain influence. For their part, Fleer paid the ballplayers extra if they provided a copy of their Topps contract and commenced an "educational" campaign aimed at the ball players that told of Topps anti-competitive contracts; this was effectively a targeted smear campaign. Fleer was bullying their way into the lucrative baseball (and football) card market, just as Topps had done in 1951. They issued "old time" sets from 1960-62 featuring retired players in black and white photographs, all the while steadily increasing their market share. Fleer also took advantage of the startup American Football league in 1960 by issuing a set of cards (and the first modern inserts) and dabbled with a Casper set. Topps held the NFL license (negotiated with the league and not the players) but in 1961 Fleer managed to score a partial victory with their combined NFL/AFL set. Topps also issued a combined set that year but Fleer and Topps returned to their respective AFL and NFL exclusivity in 1962 and '63. A 1961-62 Fleer Basketball set also was produced but did not compete against Topps, which had found out in 1957-58 that basketball was not yet worth the effort, a result Fleer also experienced. 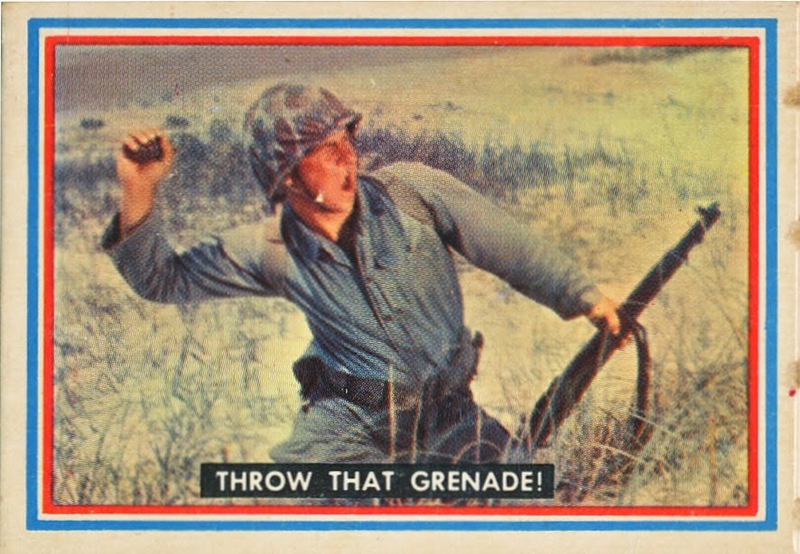 The big blow though was the 1963 Fleer Baseball set. An initial series of 66 cards was issued (with a cookie) before Topps was able to halt any further series but the company from Philadelphia had shown Topps they were serious. However, things slow down for Fleer around 1964 and Fleer and Topps both were losers when Philadelphia Gum landed the NFL license (Topps retained the AFL) and Fleer generally became sporadic with their trading card issues, possibly due to mounting legal costs. This little set may have been the impetus for the start of the great Topps test issues that commenced the same year as it allowed the purchasers to play a game of baseball with the cards. Remember, Topps would only spend money to expand market share or to defend against a perceived threat and never just added products for the sake of it at the time. Just as they had done six years earlier with the football inserts, Fleer had a little something extra to offer and Topps responded. Fleer made some half-hearted attempts in the late 60's and early 70's to re-enter the baseball card market and attempted a large-format set in 1974, which ultimately and in conjunction with the threat from a Lifesavers brand called Bubble Yum, led to the rather lengthy series of lawsuits that culminated in the great 1981 baseball card explosion. They had a long run of baseball cartoon cards commencing in 1968-69 that ran through the 1970's and were reasonably successful as well. For the most part Fleer otherwise relied upon non-sports cards (mostly funny car or auto racing related) for their trading card sets, plus an annual "In Action" series of football cards. After more than a decade of immense growth in the baseball card marketplace and the launch of NBA cards in 1986 and NFL cards by the end of the decade, the Mustin family accepted a buyout from Donruss (led by a former Fleer executive) in 1989 for a whopping $75 million. The new company went public in 1990 and then was merged into Marvel Entertainment Group (MEG) in 1992 as a transformative change among the old school entertainment and media companies took hold, fueled by venture capitalists, easy credit and "merger mania". 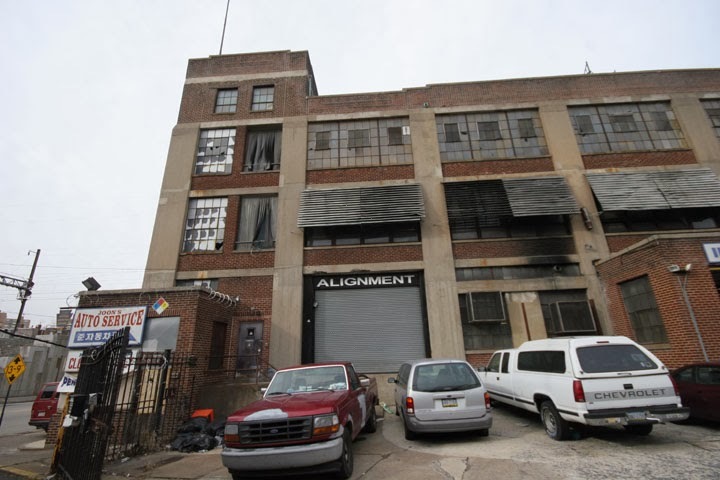 In 1994 MEG acquired Panini and SkyBox was added to the fold a year later at which time the Fleer plant in the Olney section of Philadelphia was shuttered. Alex and Randy Grass (who made Rite Aid the massive company it is today) then bought Fleer/SkyBox/Panini in 1999 after Marvel Entertainment went bankrupt but the bubble finally burst (sorry) and in 2005 an auction of remaining assets resulted in Upper Deck acquiring what remained of Fleer for just over $6 Million. 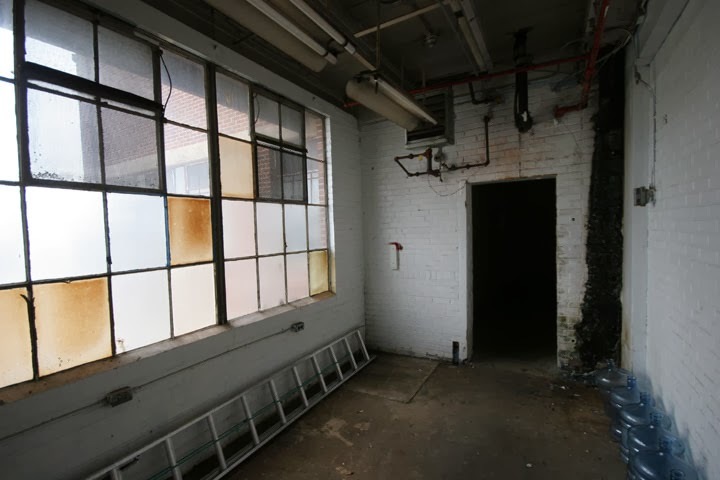 A sad but typical end to an old school production floor of the era. Sources: Sports Cards Presents "The Comprehensive Guide to Fleer Trading Cards" March 1995; 67 F.T.C. ; Fleer Corp. v. Topps Chewing Gum 501 F Supp 485 (1980); The Great American Chewing Gum Book by Robert Hendrickson, Chilton Book Company, Radnor Pennsylvania, 1976.